College Choice, a leading authority in college and university ranking and resources, has named Georgia Institute of Technology number two in it's recently published 2016 ranking for Best Bachelor's in Nuclear Engineering. 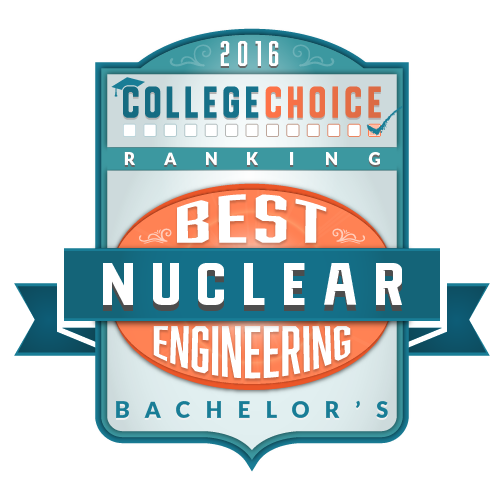 College Choice created the 2016 ranking for Best Bachelor's in Nuclear Engineering using a few key factors, including annual tuition, program features, internship opportunities, available financial aid, academic reputation, and more. College Choice stated "Nuclear engineering students at the Georgia Institute of Technology, or Georgia Tech, will pursue their program in the George W. Woodruff School of Mechanical Engineering, which merged with the School of Nuclear Engineering in 1984. The School of Engineering dates to 1962 and has maintained a track record of excellence. The Woodruff School offers training in Nuclear and Radiological Engineering (NRE) and Medical Physics (MP) through one undergraduate degree (BSNRE), two master’s degrees (MSNE and MSMP), and one doctoral degree (PhD NRE). It is consistently recognized for excellence nationally. Nuclear engineering students at Georgia Tech can expect to be challenged to demonstrate proficiency in a vast range of areas, such as the application of mathematical, scientific, and engineering principles; design of systems, components, processes, and experiments to meet a variety of economic, environmental, social, political, ethical, and medical needs; analysis and interpretation of data; teamwork, problem-solving, and professional responsibility; and communication skills, business principles, and social responsibility."